Firstly - thank you to ALL of you who came out to Disney last week for my Rey & BB8 Debut! And I'll be back again on May 20. Also - Florida folks - YES I will be at MegaCon (all four days!) in May 25-28th also. Details on events are here, more news below. Nextly - I have a new original painting for sale! This is a very special piece, it's the actual production art painting I painted to create the "Voodoo in Blue" enamel pins. Very unique collector's item, this 8x10" original acrylic painting on panel is up for auction here (and I'm throwing in a FREE Voodoo in Blue pin to go with it of course!). Click here to see, or scroll down for more details. Auction ends tomorrow! And of course, speaking of pins, we have launched my new line of Collectible Enamel Pins HERE. 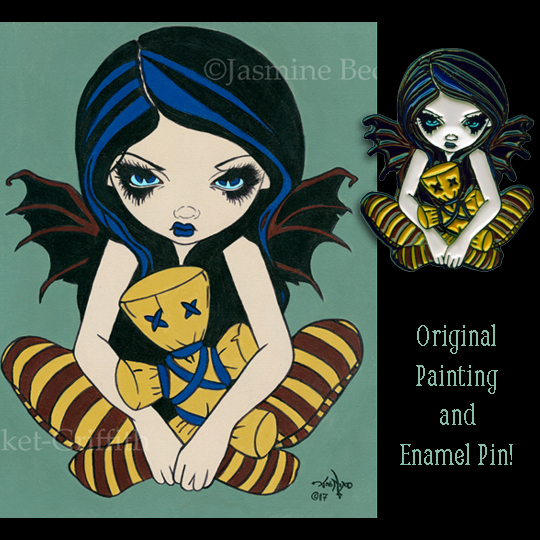 Metal & enamel, these turned out GORGEOUS and are only $12.99 and can be shipped worldwide. The Limited Edition pins are selling fast but we still have some left - go grab one while you can! From Disney - my new "The Bride Returns" Haunted Mansion prints, canvases, shirts, Vinylmation dolls and postcards are now available online, at the themeparks & galleries, and directly through Disney Parks Merchandise via phone & email. Details here or scroll down for more. In other Disney news, I'm pleased to announce I will be attending Disney's D23 Expo in Anaheim this July and will be debuting my next Disney painting - "Princess Aurora" from Sleeping Beauty! Details about the event and a sneak peek of the sketch for the painting are here! I have LOADS of news about MegaCon. My official event page for MegaCon is here - additional details are further down in this update, just scroll down in your email or browser to see. Among other news, I have a photo of the free exclusive MegaCon "Alligator Girl" pins (for the first 50 fans on Thursday and also on Friday) as well as photos of our shopping bags (free with purchase) that we will be debuting at the event! Pics are below. One of my favourite paintings- "Sun Child and Moon Child" is this week's sale print! Only $9.99 for prints, open edition canvases only $90 this week here. We have some "Last Chance" Limited Edition Canvases up on eBay - the final #25 of 25 hand embellished signed & numbered (#25 of course) of these now-sold-out editions. No more will be made. You can bid on "The World" #25 here and "Dragonfly Mermaid" #25 here. "Voodoo in Blue Pin Design"
What's this? It's an original painting! The actual "production art" I had to paint in order to create the enamel pins for "Voodoo in Blue." merchandise.guest.services@disneyparks.com or by telephone at: 877-560-6477. 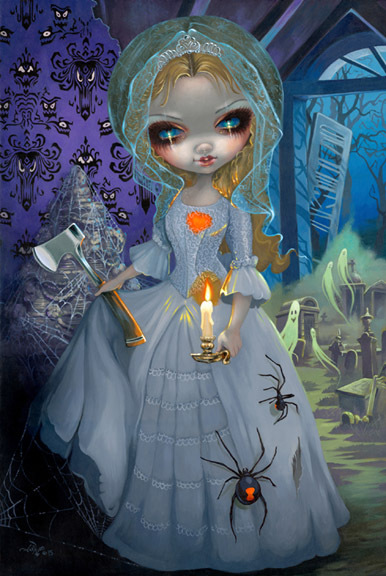 Just let them know you are interested in Jasmine Becket-Griffith’s "The Bride Returns" artwork from WonderGround Gallery. This is the second time I have painted "Constance" (the bride character from Disney's Haunted Mansion" and I ADORE this painting. The original painting sold at Disneyland, but there are postcards (ranging from $4.95-$10 depending where you buy them), matted 14x18" glossy paper prints ($39.99 - $60), and the fancy big 16x20" limited edition canvas giclees, framed, signed by me & numbered ($350 or so). There are also shirts and of course the Vinylmation Dolls (about $60-$100 depending on the store) available as well. So, I feel really bad about having had to have missed MegaCon last year, so this year I am making things extra fun! MegaCon is here in Orlando, May 25-28th. We'll be there all four days! Details here. *We will also have original paintings, tons of other collectible enamel pins, coloring books, books, canvases, framed prints, glossy prints, mini prints, oracle / tarot decks, jewelry & more. Those are the hours I am guaranteed to be there in person, so if you want to have something autographed or want to come see me personally, try your best to be there during those hours for sure! Again, the booth will always be open, these are just the hours I will for certain be at my autographing table there at my actual booth =) See you guys there! 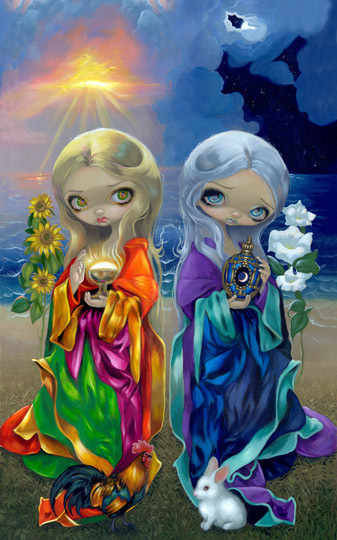 Sale Print of the Week: "Sun Child and Moon Child"
This week's SALE PRINT is "Sun Child and Moon Child" Only $9.99 on my website here - we ship worldwide! The original and limited editions sold out long ago, but the glossy photo paper prints signed by me on the back are only $9.99 this week, and the open edition canvas prints (with a signed certificate on the back!) are only $90 on sale. 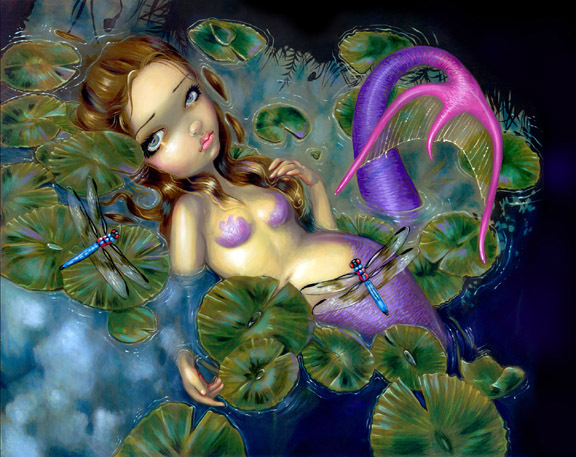 Last Chance LE Canvas "Dragonfly Mermaid"
Yes, all of our Limited Edition "Dragonfly Mermaid" canvases are now sold out, we only have ONE left - the #25 of 25 made - she is up for auction to give everybody one last fair chance at her. Bidding starts at a penny here - she is 14x11", hand embellished by me in acrylic paints, signed & numbered by me ( #25 of 25 ). Ready to hang on your wall! 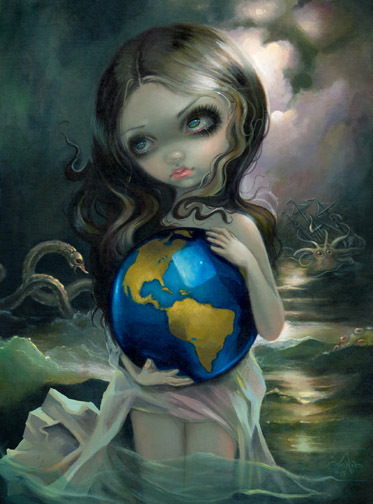 Last Chance LE Canvas "The World"
Yes, all of our Limited Edition "The World" canvases are now sold out, we only have ONE left - the #25 of 25 made - she is up for auction to give everybody one last fair chance at her. Bidding starts at a penny here - she is 11x14", hand embellished by me in acrylic paints, signed & numbered by me ( #25 of 25 ). Ready to hang on your wall! I am so excited, we have been working on these all year. 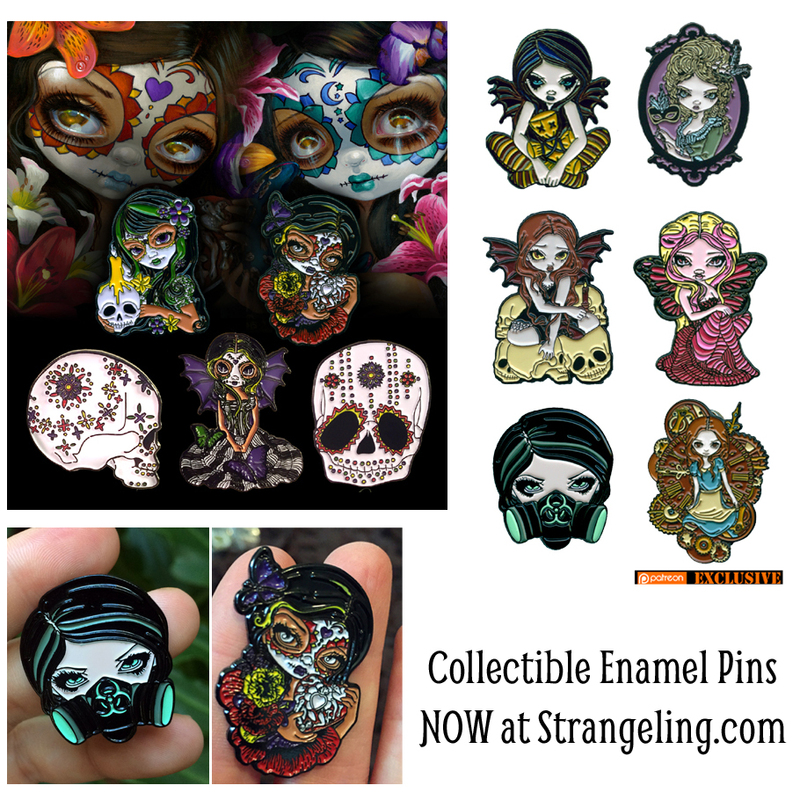 My new metal enamel pins are available NOW here on my Strangeling.com website: - only $12.99 - we ship WORLDWIDE - many designs to choose from. We'll have new releases each month on the 15th! 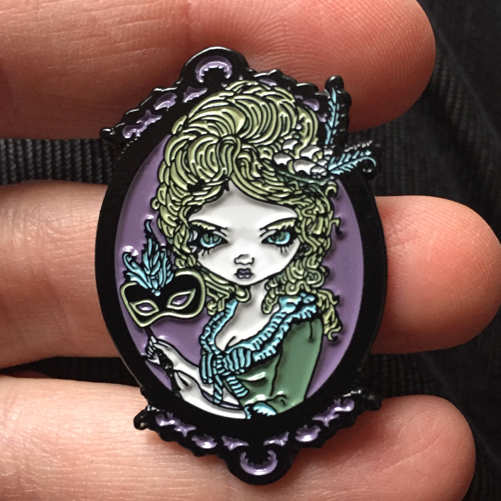 We also have Patreon Exclusive pins, starting with "Alice in Clockwork - these are only for those in the Patreon Pin Collector tier ( $25/month includes special pins only from Patreon, and at least one new pin shipped each month automatically, worldwide). Click here to sign up. We also have a new Dia de los Muertos Limited Edition set of five pins at $55, only 250 sets made here. They are already selling out fast, we are down to 170 of the 250 sets already, so grab one while you can, no more will be made. All are available NOW at Strangeling.com worldwide here and in our eBay (seller StrangelingEmporium here) and Etsy here (seller Strangeling) and on Amazon here ). I will also be doing some exclusives for upcoming events including MegaCon! Super excited about these! 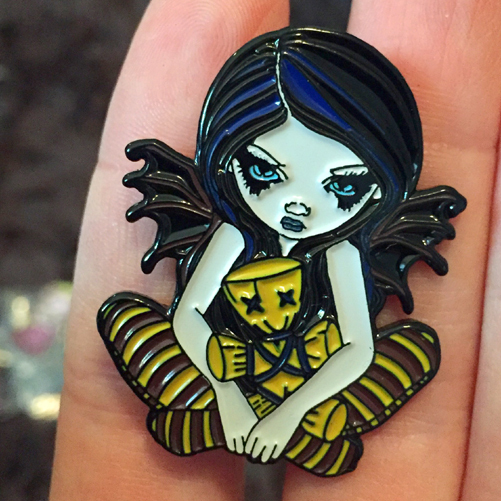 Again, if you want to make sure get new pins as they are released and not miss the Patreon pins, get enrolled in the pin-of-the-month including Patreon Exclusive free pins like "Alice in Clockwork" - be sure to sign up at Patreon here for the Pin Collector's Tier ($25 month, well worth it, you also get 10% off all other pins too). I've been working hard on these and they have turned out great!! !